The shuttle Endeavor is piggy backed over Malibu Beach on a modified 747 on it’s final flight to Los Angeles where it will be retired. Wanted to see if I could make a cool frame of the shuttle Endeavor on it’s farewell tour. Hearing it was heading down the coast, I thought I’d gamble on capturing a iconic image with a Malibu surfer on a wave, or waiting to enter the water with board in hand, as the shuttle roared low overhead. Word had it the flight would take it only 1500 feet off the ground. This is what I love about photojournalism. So many elements have to come together to make a truly iconic image. This was a miss, but a fun time nonetheless. 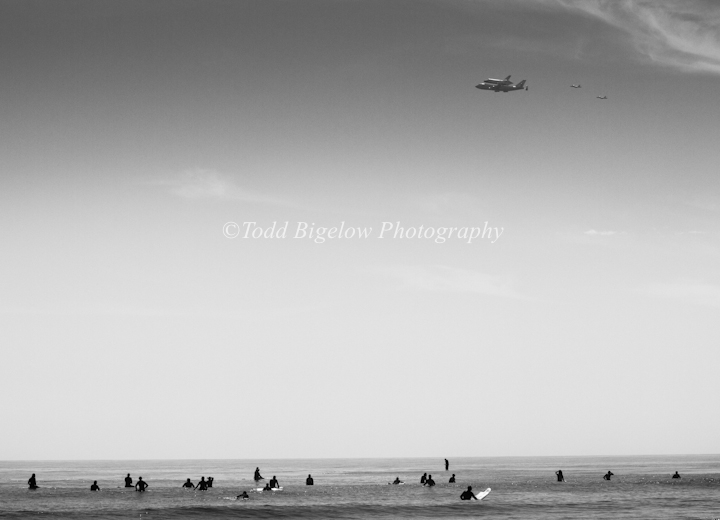 The shuttle came in way too high and there was no wave for surfers to ride as the aircraft flew by. To purchase a print or license to publish, just click on the image and it will take you to the page.